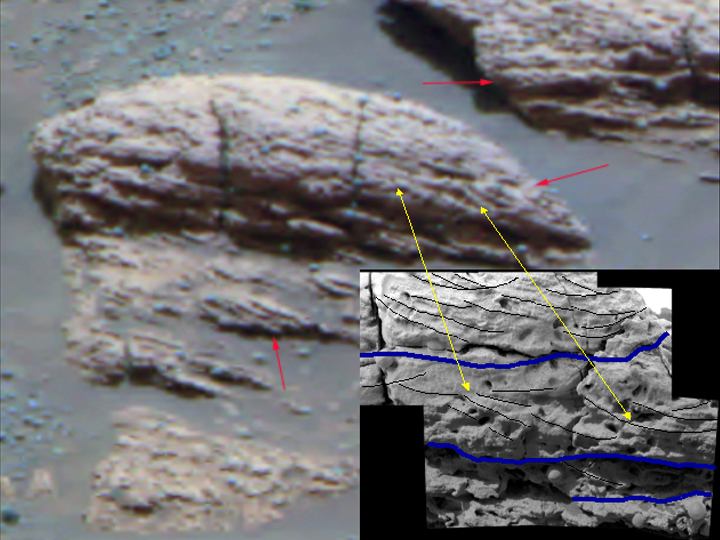 Interpretations of cross-lamination patterns presented as clues to this martian rock's origin under flowing water are marked on images taken by the panoramic camera and microscopic imager on NASA's Opportunity. The red arrows point to features suggesting cross-lamination within a rock called "Last Chance" in a panoramic camera image taken at a distance of 4.5 meters (15 feet) during Opportunity's 17th sol (February 10, 2004). The inferred sets of fine layers at angles to each other (cross-laminae) are up to 1.4 centimeters (half an inch) thick. For scale, the distance between two vertical cracks in the rock is about 7 centimeters (2.8 inches). The feature indicated by the middle red arrow suggests a pattern called trough cross-lamination, likely produced when flowing water shaped sinuous ripples in underwater sediment and pushed the ripples to migrate in one direction. The direction of the ancient flow would have been either toward or away from the line of sight from this perspective. The lower and upper red arrows point to cross-lamina sets that are consistent with underwater ripples in the sediment having moved in water that was flowing left to right from this perspective. The yellow arrows indicate places in the panoramic camera view that correlate with places in the microscope's view of the same rock. The microscopic view is a mosaic of some of the 152 microscopic imager frames of Last Chance that Opportunity took on sols 39 and 40 (March 3 and 4, 2004). This view shows cross-lamination expressed by lines that trend downward from left to right, traced with black lines in the interpretive overlay. These cross-lamination lines are consistent with dipping planes that would have formed surfaces on the down-current side of migrating ripples. Interpretive blue lines indicate boundaries between possible sets of cross-laminae.